Yes, I had heard of bitcoin a few years ago, even if I couldn’t use it properly in a sentence. But I couldn’t have told you then that in 2018 we would have a major article on “industrial-scale cryptocurrency mining” with references to things like “hashing power for the Bitcoin blockchain.” It’s the Texas article in this issue, and it’s very much a corporate real estate article — and much more. Senior Editor Gary Daughters expertly captures the potential of this nascent technology and the strategic role location plays in where it is produced. Another new term to acquaint yourself with is the Global Groundwork Index — a new location ranking created by Managing Editor Adam Bruns and Director of Programming & Analytics Daniel Boyer that blends infrastructure projects tracked by CG/LA, whose president, Norman Anderson, contributes to the Infrastructure Report; and capital investment projects from our own Conway Projects Database. What does the index measure? The territories where crucial infrastructure is already making an impact on doing business and quality of life, the cover story explains. This new index will be the centerpiece of our annual infrastructure coverage going forward. Nothing bitcoin-related appears on a list of topics readers want to see more coverage of, according to our recently completed reader survey. But I bet it will in future years, when cryptocurrency is the coin of the realm. Several topics do appear on the list: economic incentive modeling, resilience strategies, climate change implications, relocation and redevelopment costs and more case studies. One respondent suggested a case study on relationships between zoning criteria and general plan designations on various sites. Too limited an audience for that? We’ll see. More than half the respondents told us to keep doing what we’re doing, so we’re on the right track. Other survey findings: The print version is by far the preferred content format — that’s according to 86 percent of respondents. Reports of print’s death are greatly exaggerated. Asked how they apply our content day to day, one reader is a college professor and textbook author who uses Site Selection in those contexts. Another cited instances of adding locations featured in investment profiles to their site searches. Nearly half plan facility expansions in the next three years, and for the first time in recent years, the Western U.S. is tied with the Southeast as the likely destination for their capital investment. The Midwest is close behind. 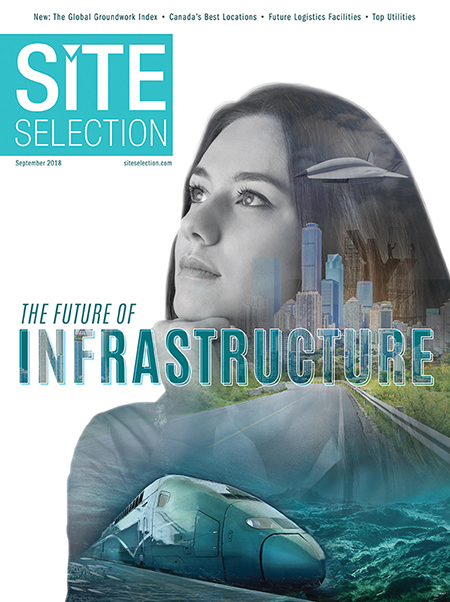 This is the issue in which you’ll find our annual Canada’s Best Locations and Top Utilities coverage, so there is September issue content you’re more familiar with in addition to the crypto-content. Enjoy it all and let us know in future surveys how you are putting it to use.